National Review post-election summit: Conservatives descend on the magazine’s conference. 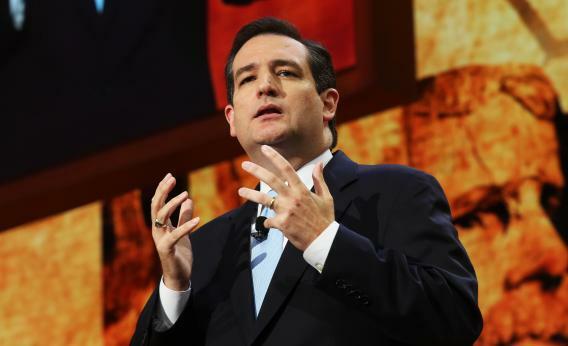 Freshman Sen. Ted Cruz (R-Texas), here during the Republican National Convention in August, attended this past weekend’s National Review conference. A well-stocked open bar cures all angst. The reception room at the National Review Institute’s post-election summit has four of ’em, loaded high with rum, whiskey, vodka, and triple sec, and O’Doul’s for those who want to fake it. When there’s an evening lull in the Omni Shoreham’s main ballroom, there’s a party waiting in the mini-ballroom across the beige hallway. Early on Friday evening hundreds of conservatives pack the room, stepping in and out of line depending on whether they’re thirsty or whether they’d rather talk to one of the available icons—Mark Steyn! Jonah Goldberg! Rich Lowry! Any hack can roll into a political conference, find the most outré attendees, and pretend that the room was packed with nothing but. National Review is a standard target of this sort of journalism. At least three times, liberals have embedded on the magazine’s biennial post-election cruises, and come out with feature-length contributions to the Those Crazy Conservatives genre. In most respects, Darrin was like the other NRI summit ticket-holders I talked to—a middle-aged guy with a successful business, worried about his lost country, worry deepened by a steady diet of conservative media. But toward the end of the conference on Sunday, I sit in on a panel titled “What is a conservative foreign policy?” And in it, National Review’s Andrew McCarthy asks why Huma Abedin had been allowed, for so long, to work alongside Secretary of State Hillary Clinton, holding a security clearance. That gets applause, something that was scarce and hard-earned at the weekend conference. National Review has only held two other post-election summits—they save ’em for real debacles. In 1993, William F. Buckley gathered 1,000 conservatives in the nearby Mayflower Hotel, to vent and strategize about the threat of Bill Clinton. In 2007, after Democrats took back Congress, NRI met at the J.W. Marriott up the street to hear from potential 2008 saviors. Laughter and groans. Conservative donors and thinkers respect Mitt Romney more than they did the defeated George H.W. Bush or the ousted, forgotten Speaker Dennis Hastert. In 1993, then-NR editor in chief John O’Sullivan told conservatives that they were in the midpoint of the “Bush-Clinton” era—that Bush had betrayed the Reagan revolution, and could not be considered part of it. In 2013, Romney is seen as a fundamentally decent man who simply did not know how to “message” conservatives’ beliefs or explain what Obama was doing wrong. “He spoke conservatism,” says Charles Krauthammer in a Friday night Q&A, “as a second language.” Speak it as a first language, and you can win. To stop that happening again, conservatives need better messaging. Nearly everybody at the summit agrees. “One of the best slogans that came out of this campaign was, ‘You built that!’ ” says Texas Sen. Ted Cruz. “I wish we could take a different tack. That was a slogan that was aimed at the 53 percent. It was aimed at business owners. It was aimed at people who already got there. I think their message should have been: You can build that.” It wasn’t that Romney’s “47 percent” tape was even so bad, says Cruz. It was that it fit into a “narrative” that Republicans are cold-blooded and the poor can never achieve anything without handouts. Fixing a “narrative” sounds deceptively easy, and fair. Democrats didn’t respond to their narrow 2004 loss by nominating an Erskine Bowles-Joe Lieberman ticket. They found a once-in-a-generation political talent, a liberal, black community organizer seen by most voters (until mid-2009) as thoughtfully moderate. No matter what he does, a preponderance of voters let him skate away. No, conservatives need to talk smarter about what they already believe. After the Q&A, I make a coffee run. On the way back, I see Kudlow and Brooks chatting politely with some of the conservatives who’d seen the panel, biding time as the TV host gets his shoes shined.